European hunting is about management, and the management is done by a much smaller number of hunters. 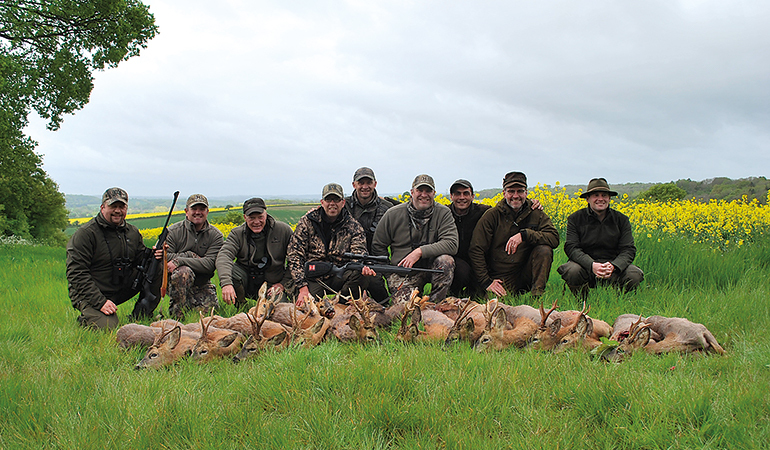 Below is the result of a three-day hunt in England with a Hornady/Merkel group. Parallels between the European roe deer and our American whitetail are many. Both are wary animals that love the mosaic, or “edge,” habitat created by a mixture of woodlot and agriculture, and both survive well in proximity to human activities. Both are extremely widespread, and in fact, it’s a toss-up as to which has the larger range. Our whitetail spans two continents, from the Amazon Basin to Canada’s treeline. The roebuck, however, also spans two continents, from the British Isles eastward across Continental Europe and deep into Asia, found in Russia’s Ural and in Turkey, northern Iraq, and Iran. The parallels are just as strong among hunters. American hunters love their whitetails but no more than Europeans love their roe deer. As in North America, the spread of wild hogs, feral in our case and the real deal in Europe, is changing things. For many European hunters, the prolific wild boar—and the damage it does—has made it the most available large game, but with nothing like the reverence our European counterparts hold for their roe deer. As with whitetails, roebuck hunting is a culture bordering on a cult, with similar methodology, including stand-hunting, spot-and-stalk, and calling. The roebuck is a very small deer, standing less than 30 inches at the shoulder, with a mature buck weighing 50 to 60 pounds. As with whitetails, only the males grow antlers, but the roebuck has a small, compact rack, normally three points per side, with upright main beams of just eight to ten inches. European hunters don’t get too wrapped up with point length. Instead they focus on mass. Are the coronets (horn bases) thick and nearly grown together? Is there a lot of “pearling” (the stubble of small almost-points, usually on the lower antlers)? These are signs of age, and above all, European hunters prefer age. Unlike the several subspecies of our whitetail, biologists identify few subspecies across the roe deer’s broad range. The closest relative is the larger Siberian roebuck, found east of the Urals to Mongolia and China. Despite attempts, the introduction of roe deer elsewhere rarely has been successful. Although the lifestyle is similar and lifespan the same (about 10 years), the roe deer’s cycle is almost opposite the whitetail. Roebucks come into hard antler in April and May and typically rut in June and July, an aggressive rut with the males fighting viciously and establishing territories. Twin spotted fawns are born in the late spring. Hunting seasons typically start in April or May and are often very long, running into autumn, when males drop their antlers. In part this is the result of a major cultural difference between European and American hunting. European hunting is all about management, and with the majority of land in private control, harvestable game is a cash crop. Venison is marketed, and there is little or no “free” hunting. European hunters are accustomed to this and are willing to pay for their passion, but there are far fewer of them over there. Management is entrusted to this smaller number of hunters, who thus enjoy the long seasons, with bag limits dictated purely by management goals. Inititally, roebuck hunting was primarily an insider’s game, with little opportunity for foreign hunters. This has changed dramatically. The dropping of the Iron Curtain and, later, the resolution of the Balkan conflicts opened up Eastern European countries to sport hunting. Much of this region is good roebuck habitat and grows some of the biggest antlers. Also, roebuck have increased significantly in Western Europe, and more hunting opportunities are available. When I first hunted Spain 30 years ago, roe deer were few in number with so-so trophy quality. Today they have increased and expanded their range, and Spain is producing exceptional bucks. Most European countries have their own unique hunting cultures, but that doesn’t mean Americans are shut out. That was once true of Spain, but today the country hosts Europe’s largest outfitting industry and offers plenty of opportunity. There are lots of local hunters in both France and Italy, but until fairly recently, it was almost impossible for foreign hunters to gain access. This has changed, and good outfitters are now established in both countries. Last year Donna and I had an awesome roebuck hunt in Italy. That’s just the tip of the iceberg. Today roebuck hunting is available in at least 20 European countries. Unless you know somebody, there is no DIY roebuck hunting (or anything else in Europe), but it doesn’t have to break the bank. Just be careful. “Medal-class” roebuck (bronze, silver, or gold by Europe’s CIC measurements) are rare, highly prized, and valuable. A lot of European hunting is priced by size: the larger the horns or antlers, the higher the price. European hunters understand this and are mentally prepared, but for American hunters, this can be a really nasty surprise. I don’t like “medal surcharges” and usually can’t afford them. I also dislike the concept of being penalized for good luck. Fortunately, it’s not mandatory. It depends on the country as well as the outfitter, but a lot of excellent roebuck hunting is priced “take ’em as they come,” or up to a certain size. Just be certain you understand the arrangement. Thanks to the way European game is managed, you’ll probably be able to take more than one buck if you choose, and while “medal” roebucks are as rare as Boone and Crockett whitetails, there are usually good numbers of nice-looking mature bucks. Some of the best roebuck hunting I’ve ever seen was in Hungary. The Danube Valley is famous for producing good antlers, but I’ve had great roebuck hunting elsewhere in Eastern Europe, and European friends tell me Serbia is a current hotspot. Some of the most affordable roebuck hunting I’ve seen, perhaps surprisingly, is in the U.K. In England and Scotland, “stalkers,” who have rights to manage private estates, typically charge by “outings” (mornings or evenings). Success is not guaranteed on any given outing, but you’ll probably have opportunity two out of three hunts. Since it is about management, throughout Europe you are expected to take an animal recommended by your guide—so be sure you’re clear on what you’re allowed. Thanks to intensive management, any time through the long season is good, but I prefer hunting roebuck in the spring and early summer. The rut does offer some advantage, but I like the long spring daylight and mild days, and if you have approval to shoot a monster, this is when a big boy is most likely to appear. Personally, I’ve never worried too much about that. Like my European friends, I seek mature bucks, but I enjoy them for what they are, which is exactly the way I hunt whitetails.